Great for indoor and outdoor events, this double sided Blitz roller banner stand allows your messages to be seen from both sides with either duplicate or different graphics. With added flexibility for exhibiting at any event come rain wind or shine, this banner stand can withstand most weather conditions. 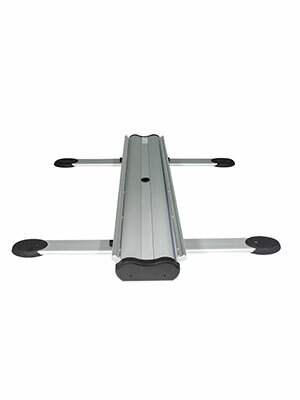 With graphics made from durable, weatherproof PVC and extra wide feet for added stability and even comes with ground pegs for added support when on soft ground. Standard roller banners have the increased risk of being permanently damaged by being used outdoors, which reduces their longevity. Choosing an outdoor banner stand reduces this risk, without compromising on style or quality. Unlike other outdoor banner stands, the graphics for our Blitz roller banner are rolled into the base unit for storage and transport. To assemble this banner, simply pull the graphics out of the base unit and attach to the top of the pole. 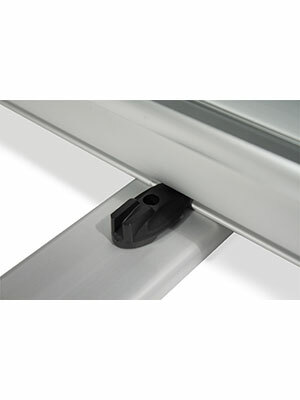 Then simply pull out the extra-wide feet to make sure your stand is secure and away you go! 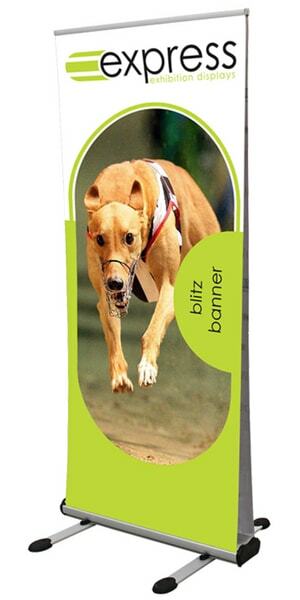 If you’d prefer to have a one sided version of this banner stand, see our single sided Blitz.